Left, 30 Dias - July 1992 - Right, 30 Dias - February 1999. (above left, the two toast the future). 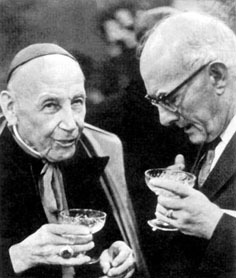 Cullmann was one of the observers of the false religions invited to Vatican II. Afterwards, he found in Joseph Ratzinger a stalwart supporter of his ideas. Question: "How do you explain this dialogue with a personage whom many Catholics view as reactionary and an enemy of ecumenical dialogue?" Answer: "I do not understand it. It is an erroneous opinion. 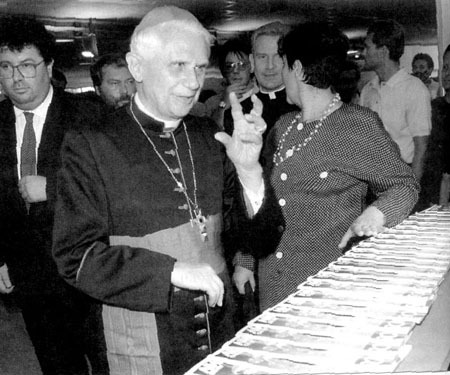 I met Ratzinger 30 years ago, at Vatican Council II. He was the best of the so-called expert theologians or periti, with a reputation for being a radical progressivist" (1). since the times of the Council" (2). One of the principle points Cullmann expounded was that St. Peter had no successor. 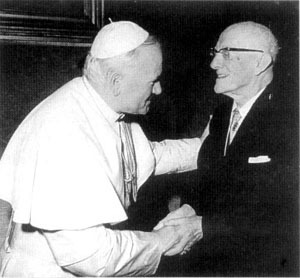 Above right, he is warmly greeted by John Paul II. in 30 Dias, March 1993, P.13. Historia da salvacao," February 1999, p. 21.